Grinnell Glacier Trail in Glacier National Park. 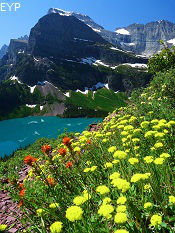 This is a view of Glacier National Park's Grinnell Glacier from the Grinnell Glacier Overlook located off of the Highline Trail. 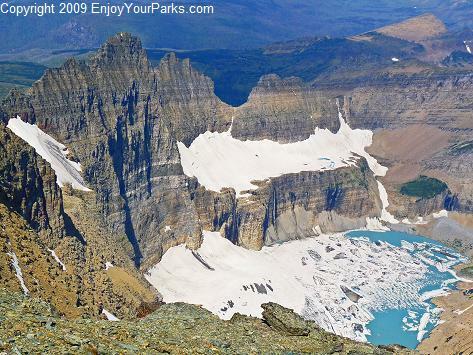 On the Grinnell Glacier Trail, you actually get to see the glacier right next to you! 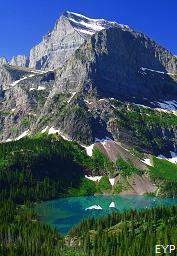 is one of the most iconic glaciers in Glacier National Park, and is definitely the most visited. 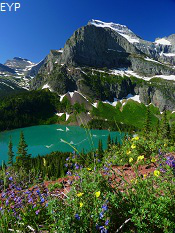 Located just 5.5 miles from the Many Glacier Hotel, or only 3.8 miles if you take the Many Glacier Boat Tour, you'll actually get very close to three glaciers on this hike: Grinnell, Salamander and Gem. 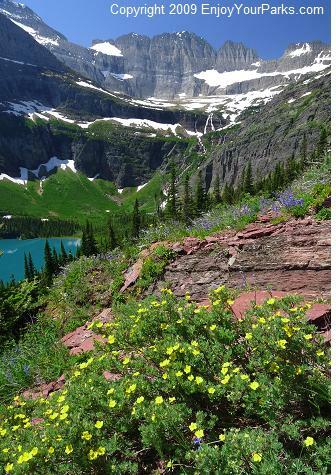 The Grinnell Glacier Trail is gorgeous, and that in itself is worth the trip! 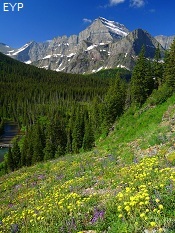 Mount Gould towers above you the entire time as you climb 1600 vertical feet! 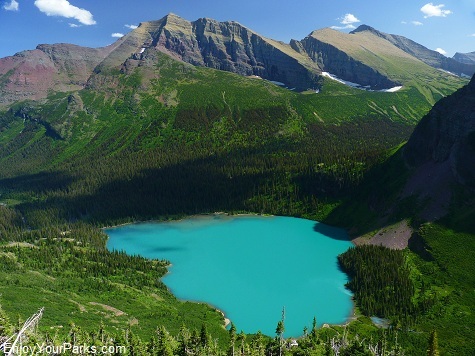 As you ascend, far below the trail you'll see Grinnell Lake, a glacial lake that is a brilliant turquoise color due to the glaciation occurring above it from the Grinnell, Salamander, and Gem glaciers. 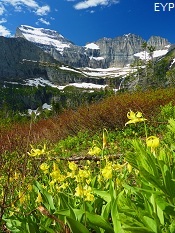 A classic view of Grinnell Lake and Mount Gould from the Grinnell Glacier Trail. 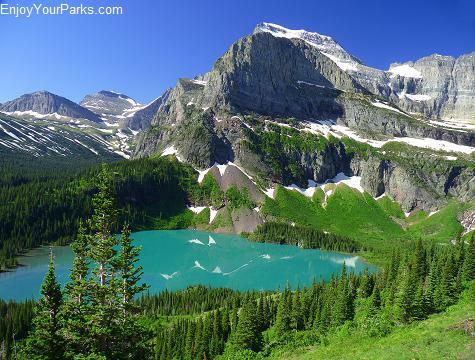 This trail is one of the most gorgeous trails in the world, so take your time and enjoy the view! Glacier National Park. 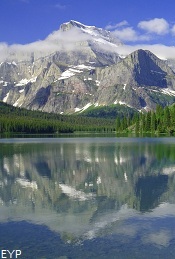 This is a view of Mount Gould from the Lake Josephine boat dock on your way up the Grinnell Glacier Trail. 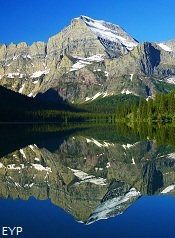 This is a great place to take a photo of this iconic mountain in the Many Glacier Area! 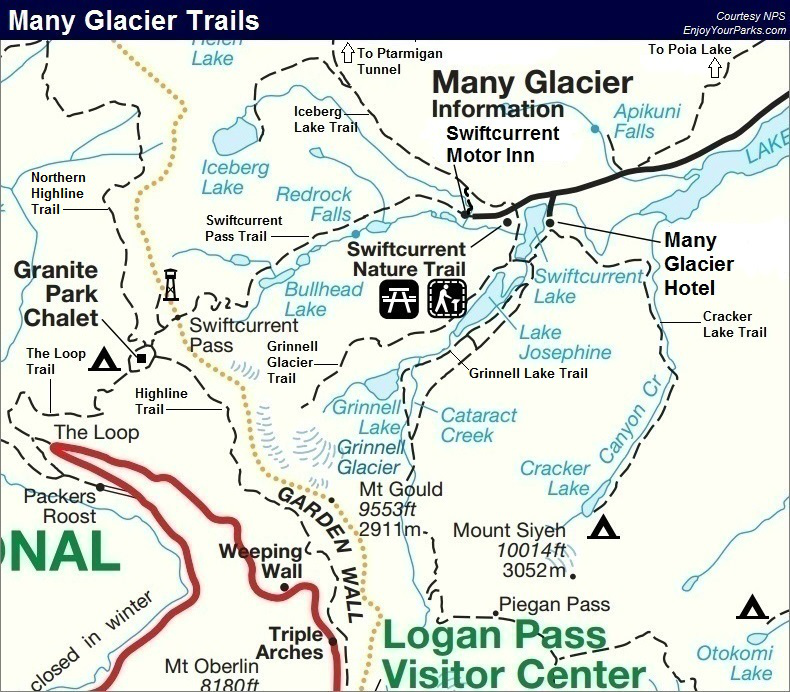 TRAILHEAD: Grinnell Glacier Trailhead is located at the Many Glacier Picnic Area found on the main road between the Many Glacier Hotel and Swiftcurrent Motor Inn. 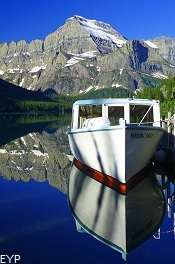 DISTANCE: 5.5 Miles (one way), or 3.8 miles if you first take the Many Glacier Boat Tour. 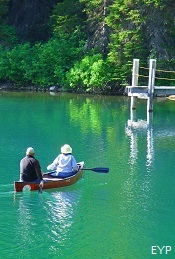 To make your day far more enjoyable and less tiring, we STONGLY recommend that you take the earliest boat ride that is scheduled. 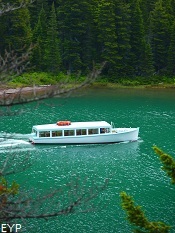 The boat ride saves you 1.7 miles each way, which can really save your legs. 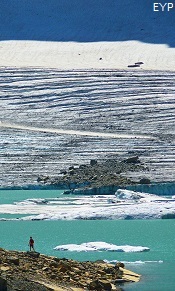 In front of the Many Glacier Hotel is the boat dock. 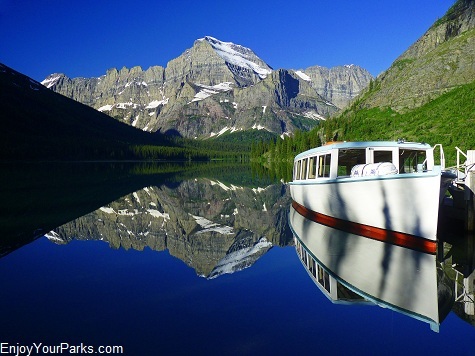 This tour boat takes you on Swiftcurrent Lake, and then drops you off on the other side. 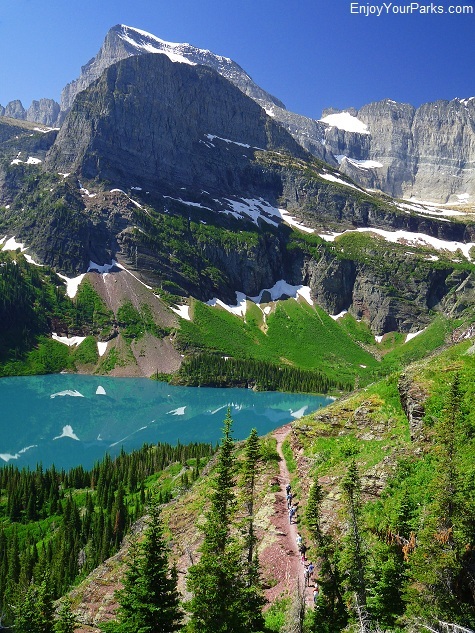 You then take an easy quarter mile walk to Lake Josephine, where another boat will pick you up and take you to the other end. 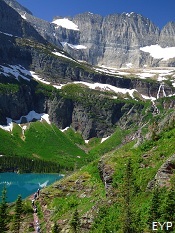 At that point you will begin your hike up the Grinnell Glacier Trail, where you will climb approximately 1600 feet in 3.8 miles to reach the glacier. 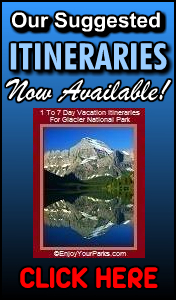 For more information on the Many Glacier Boat Tour, click here. 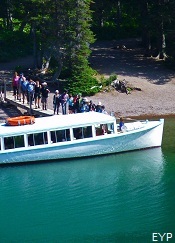 This boat ride is not only beautiful, the boat captain will also be your tour guide and will point out fasinating things on the way to the trail. 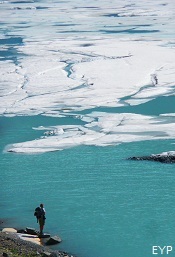 The Many Glacier Boat Tour is fun, interesting and entertaining- you will really, really enjoy it! 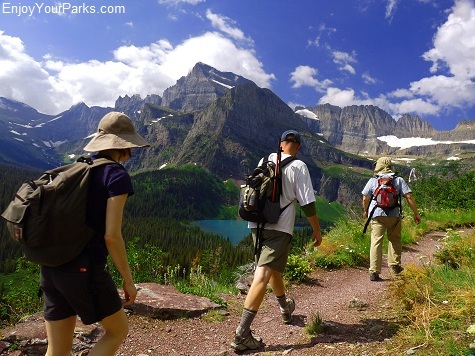 IF YOU DON'T TAKE THE BOAT and would prefer to hike the entire 5.5 miles, the Grinnell Glacier Trail trailhead is located between the Many Glacier Hotel and the Swiftcurrent Motor Inn Store. 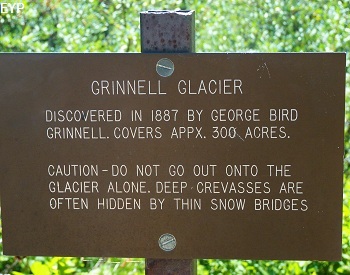 You will see a large sign and a large parking lot where the Grinnell Glacier Trailhead is located. 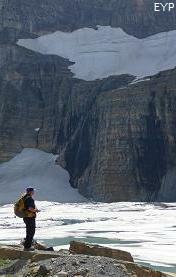 These walls above the Grinnell Glacier are several thousand feet high! 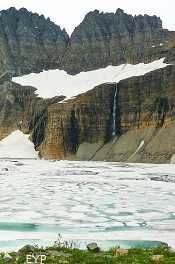 The ice mass that carved these incredible cliffs was nearly 6 thousand feet thick, and it all happened during the last ice age approximately 10,000 years ago. 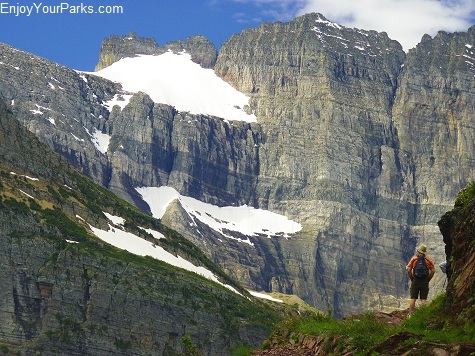 These giants are known as "valley glaciers" and their affect on the landscape is where Glacier National Park got its name. 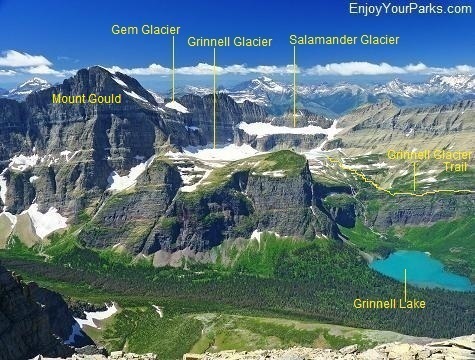 The glaciers that begain to inhabit Glacier Park after the last ice age, and what you see today, such as Grinnell Glacier, are known as "alpine glaciers". 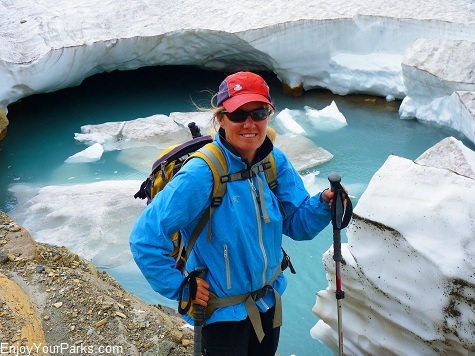 This type of glacier is much smaller in size in comparison to the valley glaciers of the last ice age, but are still fun to look at and explore! 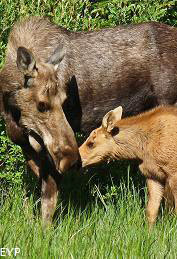 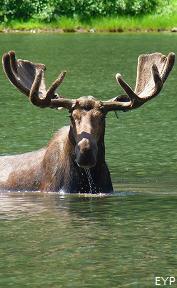 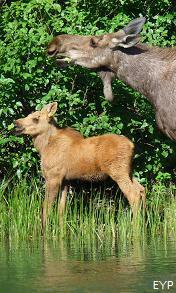 IF YOU ARE THE FIRST ONE OFF THE BOAT in the morning, make a lot of noise and bring bear spray. 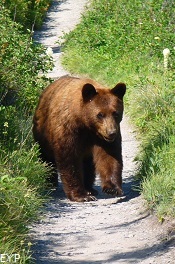 Bears have been known to use the Grinnell Glacier Trail, especially in the early morning hours. 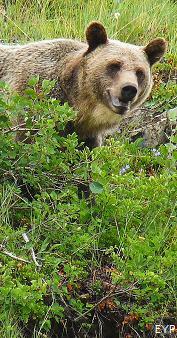 Whenever you are heading around a "blind corner", talk loud and proceed cautiously so you don't end up surprising a bear. 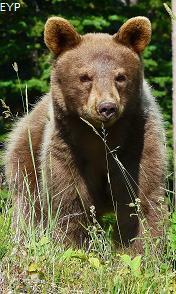 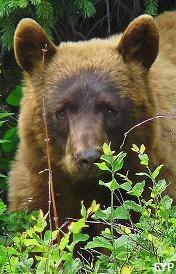 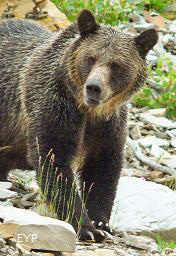 It is not uncommon to see black bear and grizzly bears on your way up to Grinnell Glacier. 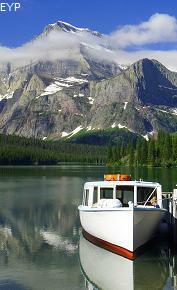 This is the famous wooden boat "Morning Eagle" on Lake Josephine. 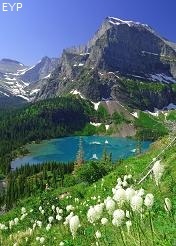 She will take you to the far shore so you can begin your ascent to the Grinnell Glacier which is located in the rugged mountains in the distance. 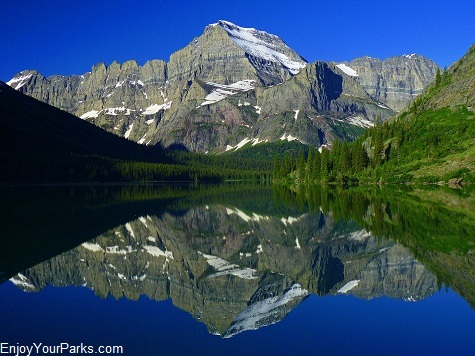 The Many Glacier Boat Tour is a treat in itself! 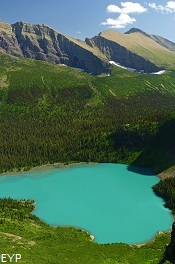 This is a view of the entire Grinnell Glacier Area, including the turquoised colored lower Grinnell Lake, from the summit of Allen Mountain. 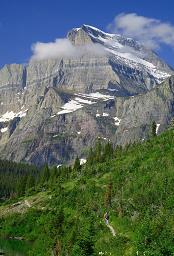 Allen Mountain sits directly east of the Grinnell Glacier Area. 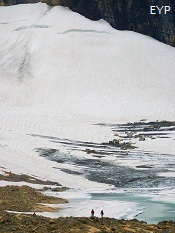 The Moraine is where the trail reaches its tallest point in this photo. 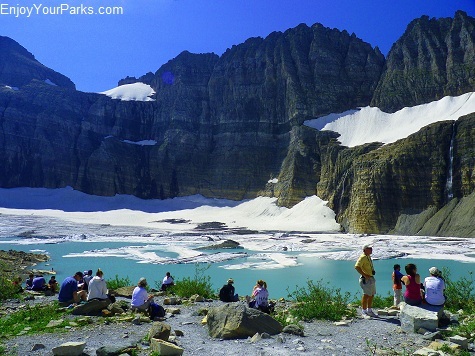 Once you get to the top of the Moraine (large natural "gravel pile" above the pit toilet) and you are overlooking the Grinnell Glacier, that's a great place for lunch. 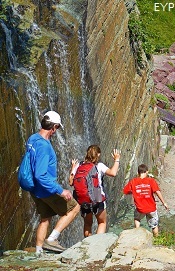 After you've re-energized, some of you will want to head left (south) and walk along the rocks to what we call "The Outlet". 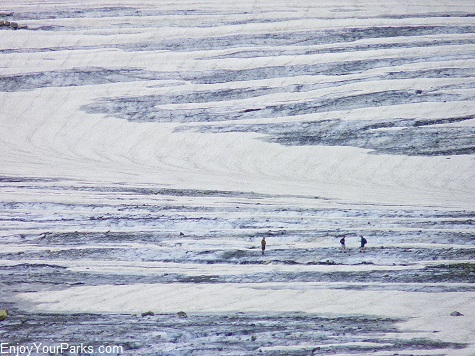 This is where all of the melted ice flows out and down into the valley below. 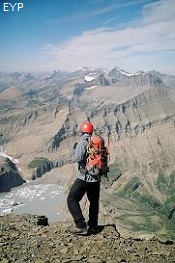 Directly above the outlet is Grinnell Glacier. 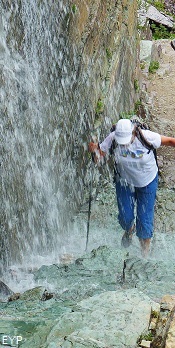 It's a fun walk and you'll get to see a lot of fascinating things. 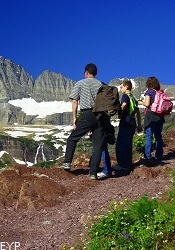 Hikers walking along the edge of Upper Grinnell Lake. 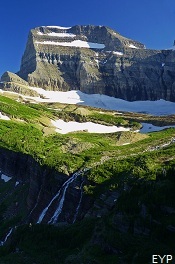 Grinnell Glacier towers above them. 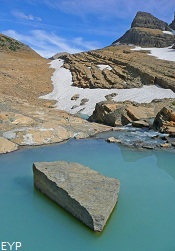 There's a really easy trail to get you to this spot from the Moraine. 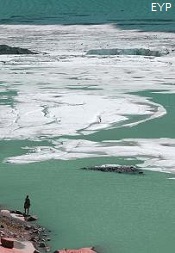 FINAL DECISION: TAKE THE BOAT BACK, OR WALK BACK. 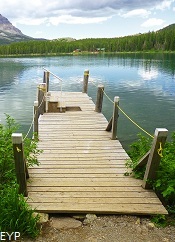 If you get to the boat dock on Lake Josephine in time (3 o'clock), then we feel that's best because you're going to be tired, and your legs and feet will really appreciate the break. 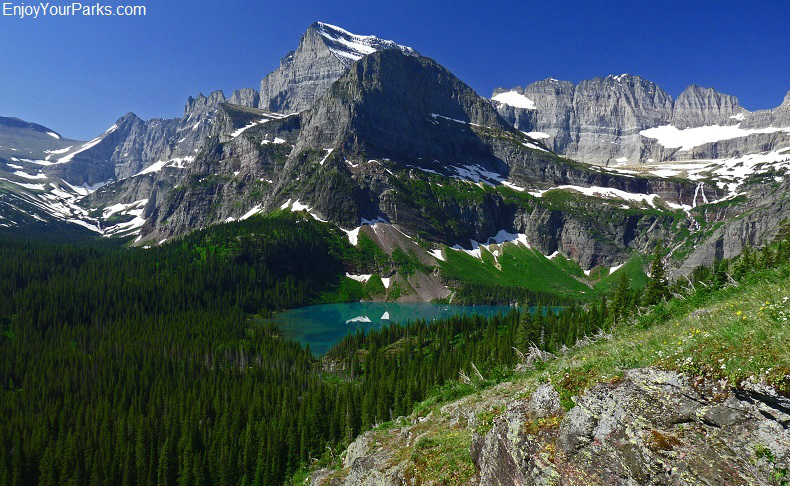 However, if you would prefer to take more time at the Grinnell Glacier and you miss the boat, then you'll get to enjoy the walk back. 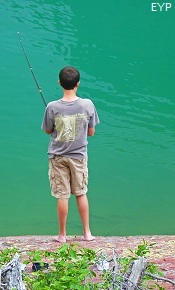 RECOMMENDATION: Try to make the boat. 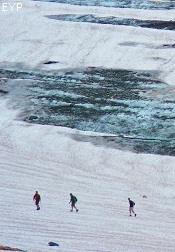 Hikers walking on Grinnell Glacier in Glacier National Park. 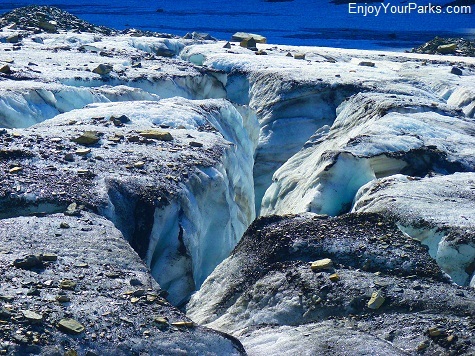 This can be extremely dangerous due to hidden crevasses. 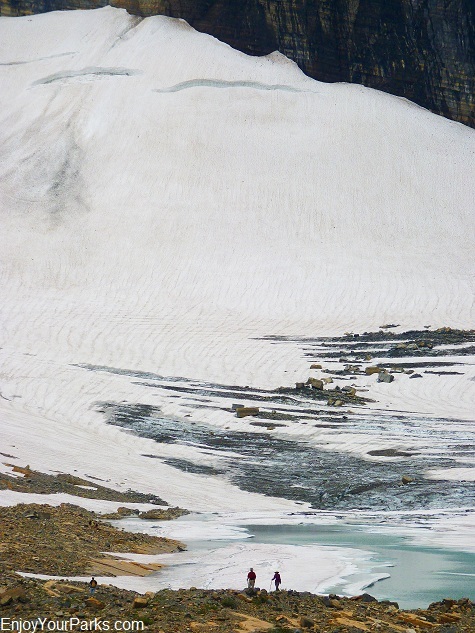 Speaking of crevasses...These large cracks in Grinnell Glacier can be extremely deep and deadly, and that is why it is not recommended that you walk on the glacier unless you are experienced in glacier travel (and equipped for glacier travel). 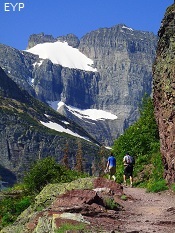 THE GRINNELL GLACIER TRAIL IS THE MOST PHYSICALLY DEMANDING HIKE OF "GLACIER'S TOP TEN". 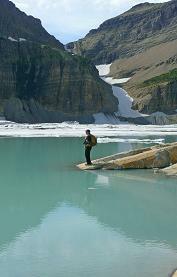 When hiking on the Grinnell Glacier Trail, take you time, and rest as often as needed. 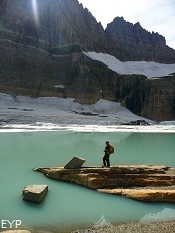 If you feel you are unable to reach the Grinnell Glacier, THAT'S OK! 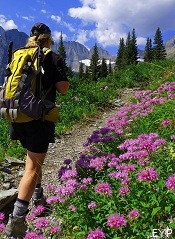 This trail is absolutely gorgeous and the views are tremendous the entire way, and you will enjoy each step. 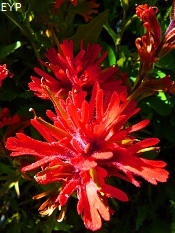 So don't worry. 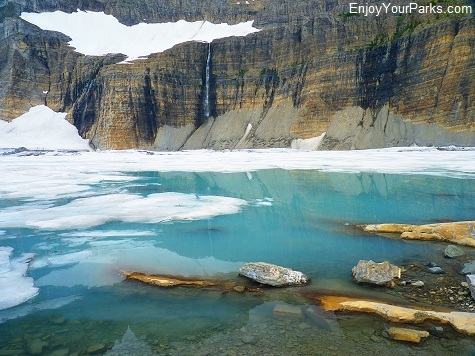 Relax and enjoy the day! 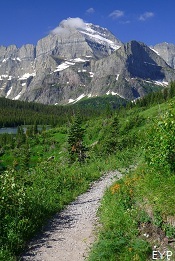 You can't go wrong on this trail regardless if you make it to Grinnell Glacier or not! 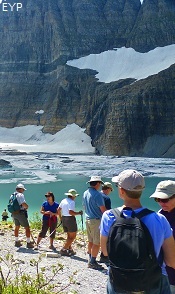 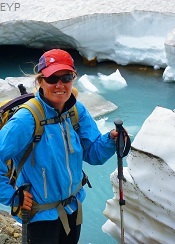 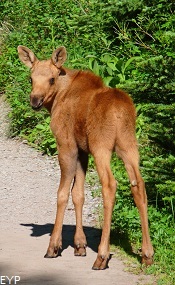 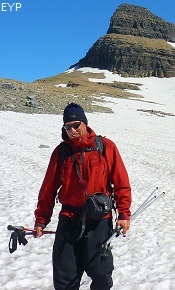 To learn about what to bring and what to wear on this day hike on the Grinnell Glacier Trail, visit our E-Book entitled "The Ultimate Checklist". 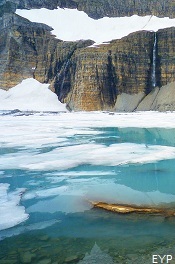 This is a view of Mount Gould (right) and the "Angel Wing" (left) as you get closer and closer to your destination. 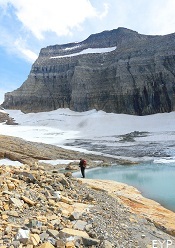 At the base of Gould you can see a small portion of Grinnell Glacier from here. 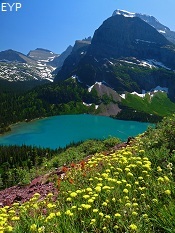 Grinnell Lake is a bright turquoise because of all the "glacial flour" created by Grinnell, Salamander and Gem Glacier grinding the rock as they slowly move down the mountain. 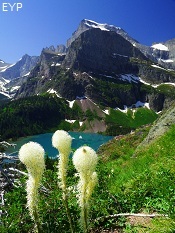 This is Grinnell Lake as viewed from Grinnell Glacier. 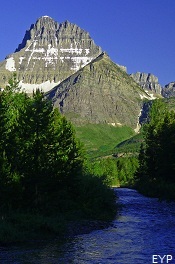 Above it to the east is Allen Mountain. 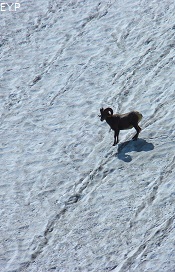 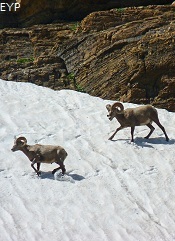 This bighorn sheep ram trotted down Grinnell Glacier and gave everyone a show. 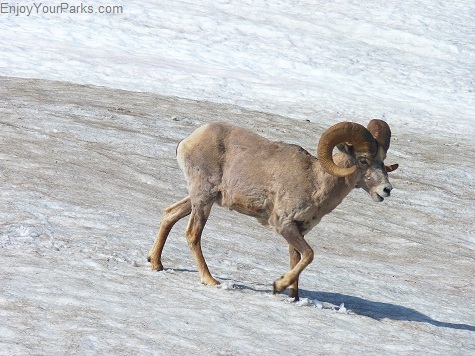 There are a lot of bighorn rams in the Many Glacier Area, and can be seen at any time along the trail, so make sure your cameras are ready! 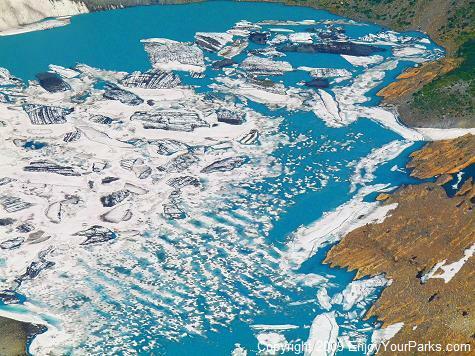 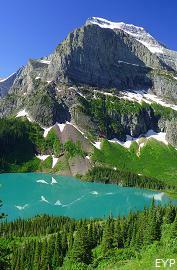 Glacier National Park's Upper Grinnell Lake has icebergs on it all summer long, and it is fed by the Grinnell Glacier. 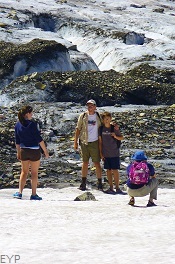 You've really got to know what you're doing when walking on the Grinnell Glacier. 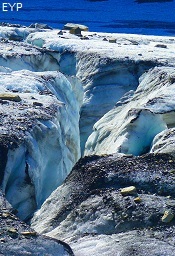 Crevasses can be covered with a thin layer of snow, and in an instant you could literally disappear! 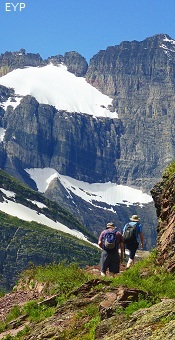 Hikers enjoying the incredible scenery as they work their way up the Grinnell Glacier Trail. 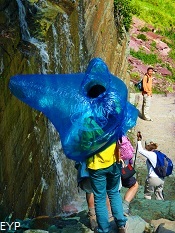 For a very informative checklist on what to bring on this hike, check out our Informative E-Books! 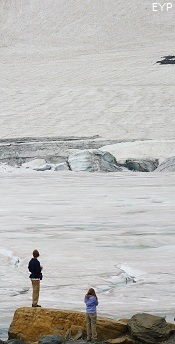 Shannon is standing next to a river that is flowing underneath a huge snow field. 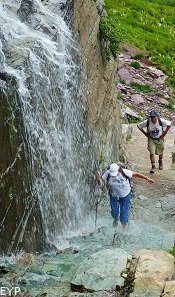 This obviously can be extremely dangerous for anyone who falls into it. 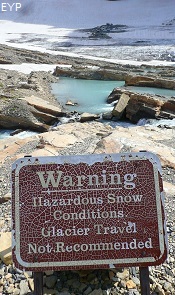 Again, it's best to stay off these hazards while exploring Glacier Park's Grinnell Glacier! 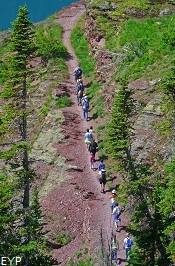 Hikers enjoying the view on a large moraine (gravel pile) created by Grinnell Glacier pushing and cutting rocks). 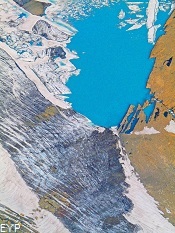 Upper Grinnel Lake, Salamander Glacier, Gem Glacier and a portion of Grinnell Glacier is seen in this photo. 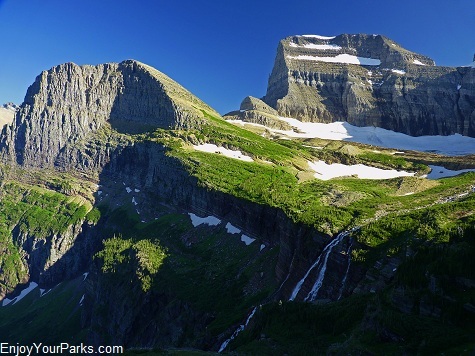 The Grinnell Glacier Trail is one of Glacier National Park's most popular hikes! 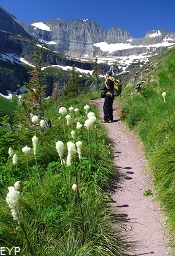 Hikers working their way up the Grinnell Glacier Trail in Glacier Park. 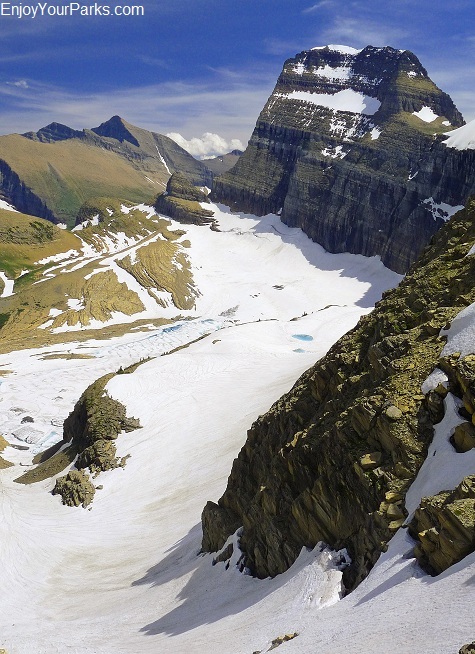 This is a view from the Summit of Mount Gould in Glacier National Park. 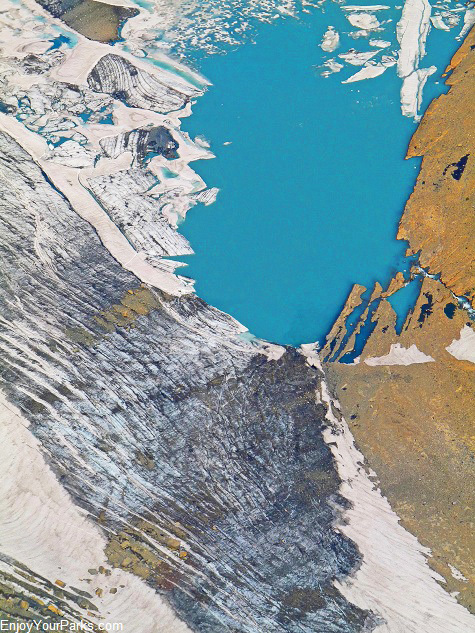 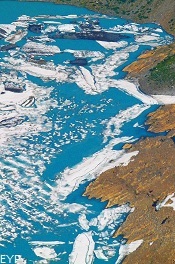 Gem Glacier is located in the upper left, Salamander Glacier is the upper middle glacier, and Grinnell Glacier is below Salamander (most of it is not visible from this angle). 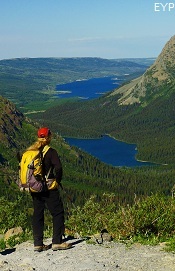 This is upper Grinnell Lake as seen from the summit of Mount Gould. 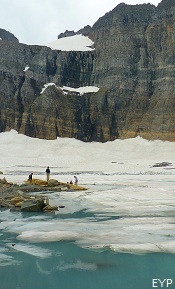 Hikers coming up from the Grinnell Glacier Trail end up on the shore of the lake to the right in this photo. 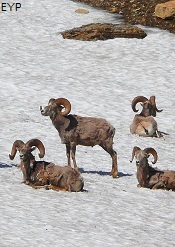 They look like tiny ants from up here! 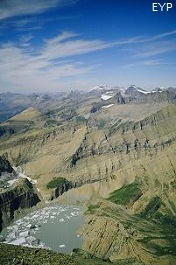 This is a portion of Grinnell Glacier as viewed from the summit of Mount Gould. 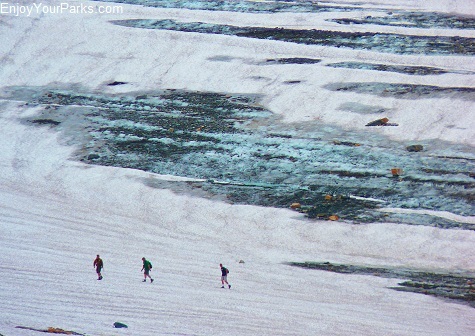 We are several thousand feet directly above the glacier. 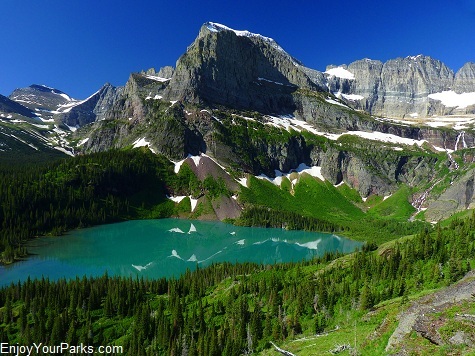 The lake at the base of the glacier is Upper Grinnell Lake, which is where you will be once you've completed the Grinnell Glacier Trail.